Amp does 600 watts rms between 1-4 ohms. That is actually amazing and beats the Jl Audio 500/1 which does 500 watts between 1.5-4 ohms. Great amp! 400w x 1 @ 2 ohms. Give your subs the power they crave with RX400.1, driving 400 watts into 2 ohms. Backlit Blue Phoenix Gold Logo. Compact Size for Easy Installation. Surface Mount Component Technology. 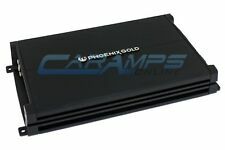 New Phoenix Gold SX400.1 SX Series Mono-Block Amplifier 400W Compact Amp. Condition is New. Shipped with USPS Priority Mail. Model: Ti1500.1. Monoblock Power Amplifier - 1500W x 1 @ 1 Ohm. This power amplifier is previously owned and inspected and is in excellent working condition. There are light surface marks on the body from regular use and handling. Give your subs the power they crave with RX500.1, driving 500 watts into 2 ohms. 500w x 1 @ 2 ohms. 300w x 1 @ 4 ohms. RMS Power Output. 0 to 180 Degrees. Greater than 200. Damping Factor. Typical Efficiency. UP FOR SALE IS APhoenix Gold RSD 1200.1 MONO AMPLIFIER. AMP IS IN GREAT SHAPE AND LIKE NEW. Phoenix Gold Z1000.1. Phoenix Gold Z1000.1 Features 1,000 Watts RMS Z Series 1 Channel Car Amp. 400 watts RMS x 1 at 4 ohms. 700 watts RMS x 1 at 2 ohms. 1,000 watts RMS x 1 at 1 ohm. 1-channel class D car amplifier. PHOENIX GOLD Ti3 1300.1 1300WRMS MONO SUB AMP, TOP OF THE LINE!!! Phoenix Gold R Series RX500.1 Monoblock Amplifiers. Condition is New. Shipped with USPS Priority Mail. Z Series Monoblock Amplifier. High Level Auto Turn On: powers on the amplifier when an audio signal is supplied. Phoenix Gold. Low Level RCA Outputs: to connect to other amplifiers. 1000w x 1 @ 1 ohm. New in box. 250w x 1 @ 2 ohms. 150w x 1 @ 4 ohms. RMS Power Output. 0 to 180 Degrees. Greater than 200. Damping Factor. Typical Efficiency. Phoenix Gold Xenon X1200.1 Amp Amplifier. Condition is Used. 100% great working and functioning just as it should condition! Please view pictures for cosmetics as the pictures are part of our description. US shipping at this time only! Thank you! PHOENIX GOLD Z1000.1. PHOENIX GOLD - Z1000.1. 1000w x 1 @ 1 ohm. (Watts x Channels)2000W. (Watts x Channels)1000W. AMPLIFIER FEATURES. High Level Auto Turn On: powers on the amplifier when an audio signal is supplied. 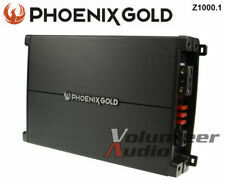 New in the box Phoenix Gold TI1500.1 1500 watts at 1ohm sub amplifier. This is a heavy and large in size amp and it was made. Typical current draw at idle. Subwoofer Channel Output Power i will always do anything to make the sale go smoothly and if anything ever happens(which is usually doesn't), i will take care of everything! Phoenix Gold SX 400.1 subwoofer amplifier in excellent used condition. The amp is rated at 250 watts into 4 ohms and 400 into 2 ohms. Hard to find, especially in this condition! Incredible power and can be used for SQ! 1000 watts x 1 @ 4 ohms mono. 500 watts x 2 @ 2 ohms. The 300-watt monoblock amplifier is engineered with state of the art full range class-D circuitry that operates at over 70% efficiency and can fit in almost any installation and without sacrificing any of the legendary Phoenix Gold power. Phoenix Gold Xenon X1200.1 Amp Amplifier. Condition is Used. 100% great working and functioning just as it should condition! Please view pictures for cosmetics as the pictures are part of our description. Amplifier only US shipping at this time only! US shipping at this time only! Thank you!